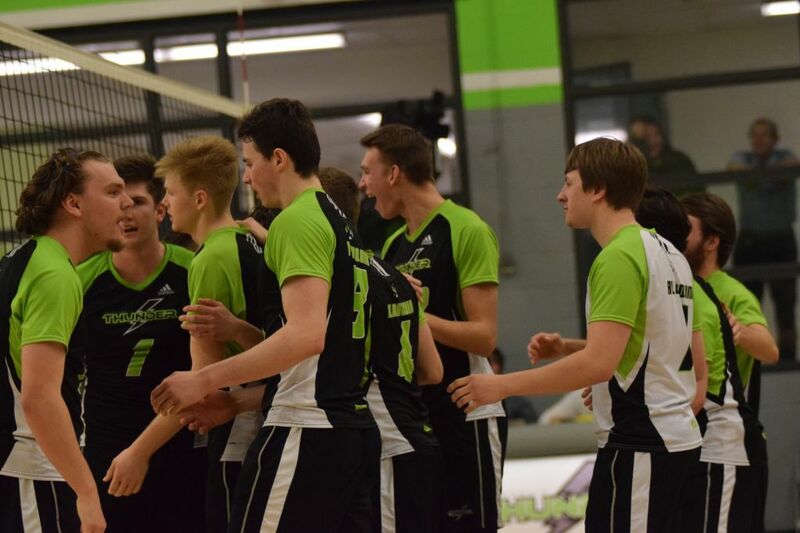 The Algonquin Thunder men’s volleyball team pulled out the win in a tightly contested matchup against the Canadore Panthers on Jan. 25. The two teams came into the night with an equal record, both posting a solid 9-4 this season. The Thunder came out of the gates hot, winning the first two sets of the game. It looked all but over as the third set took place. The Panthers then seemed to come alive, winning a close third set with a score of 25-23. They then fought hard and forced a fifth set, closing out the fourth with a 25-22 victory. The Thunder bounced back to take the win home, closing out the Panthers with a 15-13 win in the fifth and final set. Although the game could have been over with a lot sooner than what it was, the men showed their resilience and determination to close out the game. “It’s just our guys, a lot of energy. Our other center came in, did his job, fired up the other guys,” said setter Jackie Nguyen. The Thunder are looking to tweak and perfect their games before the start of the post-season, somewhere they look to thrive and conquer in. The men now sit four points out of first place, which currently has the Georgian Grizzlies sitting atop with 24 points. With a couple of games left in the season before the playoffs begin, the men hope to climb the standings to secure a better position throughout the post-season. Mens Thunder Volleyball tame Panthers, improve to 10-4 Reviewed by Bradley Legault on January 27, 2019 .